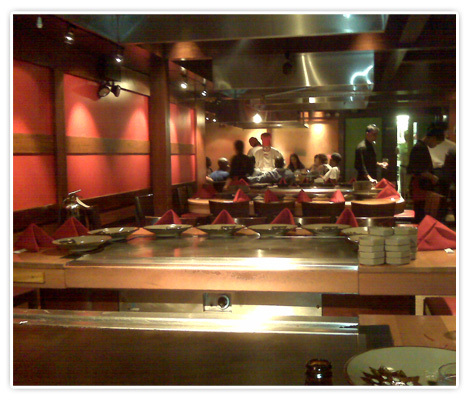 Last Saturday night we went to Benihana in NYC for my best friend, Carlos’s Birthday. It was my first time there but Carlos raves about this place. 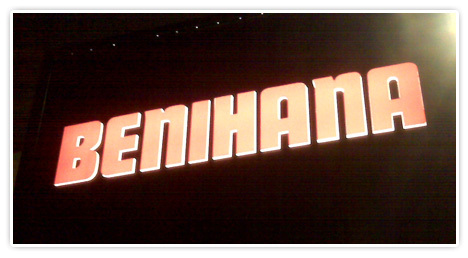 If you haven’t heard of Benihana, it’s a Japanese/Hibachi, family style restaurant. The chef cooks right in front of you and sharing a table is the norm. It was seven of us so we pretty much took over. Our chef, Jimmy…OOOHHH MANN…This guy was funny! He started joking with us and pretending to be Latino. He actually spoke Spanish pretty well. For the first ten minutes he kept saying his name was Jose and his favorite saying of all…”OHH JIMMY’S DAH MAN!” HaHa! He did a bunch of cool tricks, definitely an attention grabber. Menu time…I love food so everything sounded GREAT!! 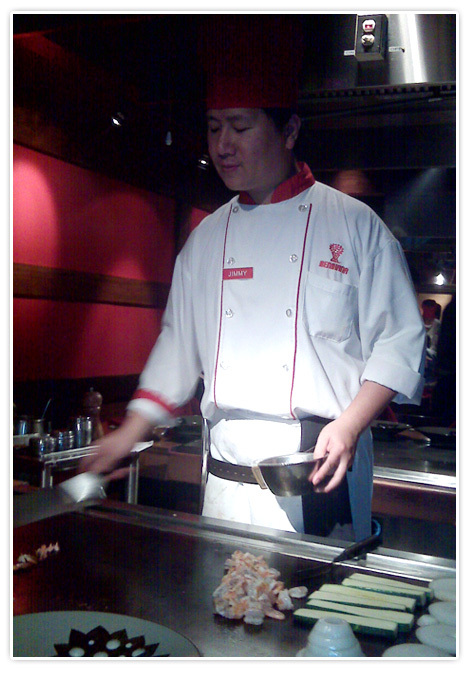 Eventually, I ordered the Benihana Steak…My choice: medium rare. I like a little juice, lol! The steak was accompanied by chicken and vegetable fried rice. One word: SLAMMING! Jimmy continued by throwing shrimps, zucchini, and other veggies on the grill. Kat ordered some sushi. Yes! Sushi! We came all the way out here and that’s what she orders. Of course she got her usual, California roll, Salmon Avocado roll and Spicy Tuna roll. Kat gets sick from eating Chinese take out and some other types of Asian food. 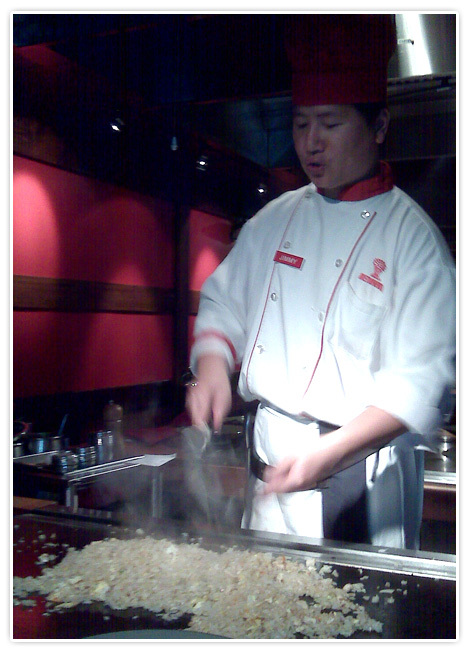 But seeing the chef cook right in front of us, all the ingredients seemed pretty ordinary. She missed out! L Carlos ordered Surf and Turf and so did most of the others. I won’t lie; I had a bite or two of their food! Kat doesn’t call me her little vacuum cleaner for nothing! All in all, the food was GREAT! The Sake shots didn’t hurt either…lol! I must say for being the city in the liquor was pretty cheap. Entrees looked to be about $20 to $30 dollars on average. Now for the one and only complaint… The temperature!! This place was STEAMING! Do not go there with heavy clothing. All the cooking in the room gets the place super hot!!! I would definitely return, since the food was off the hook, but next time I will wear a t-shirt!! !